The perpetrators of these despicable acts have declared themselves and will not stop. They have perverted Zionism to suit their extremist beliefs and have been driven towards violence. This time they went too far. On Tuesday morning a group of 50 right wing, ultra-nationalist Israeli settlers broke into a West Bank Israeli military base and burned tires, vandalized property, threw rocks at the jeep of a senior officer and spread nails on the road. One Israeli Defense Force officer was lightly wounded. This was not the first attack by Israelis against their military. Israel's Prime Minister Benjamin Netanyahu, whose government coalition is sustained by some who are sympathetic if not outright supportive of the settler enterprise, called the attack "unprecedented." He further promised to "conquer this evil affliction." Defense Minister Ehud Barak called this "Jewish terror." Opposition leader Tzipi Livni said the attack represented a "struggle over Zionism and over the character of Israel." Tuesday's incident was the most recent of so-called "price tag" incidents by ultra-nationalist Israeli settlers -- acts of violence and vandalism aimed at Palestinians, the Israeli military, and Israeli left. They are called price tag incidents because they are meant to exact a "price" for acts that undermine the settlement enterprise and are seen as supportive of the Palestinians, and for incidents of Palestinian violence against settlers. Recent price tag attacks include defacing the Tel Aviv memorial for assassinated Israeli prime minister Yitzhak Rabin, who signed the 1993 Oslo Accords with Yasser Arafat and the PLO, with the words "Price Tag" and "Free Yigal Amir" -- Rabin's right-wing, ultra-nationalist assassin; an arson at a mosque in northern Israel; and a false bomb scare and five counts of vandalism, including spray painting "Death to Arabs" at the Jerusalem headquarters of Peace Now, an Israeli NGO. The above incidents all took place within Israel's 1967 border. 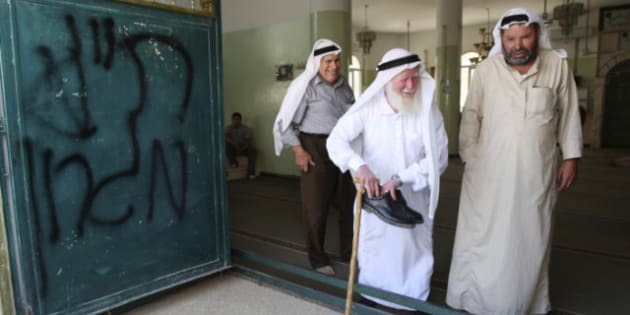 In the West Bank, attacks on Palestinian property were up 57 per cent in the first seven months of 2011. Israel is at a crossroads. The perpetrators of these despicable acts have declared themselves and will not stop. They have perverted Zionism to suit their extremist beliefs and have been driven towards violence. They have disregarded rabbis' calls to end the attacks. When on Wednesday police tried to arrest suspects linked to the recent incidents, they were attacked by right-wing nationalists. Later that day a Jerusalem mosque was set on fire and had its walls defaced. This is a concerted effort to undermine the state and assert that in Greater Israel the law of God rules; woe to anyone who stands in His way. Tzipi Livni was right. This represents a struggle over Zionism and the character of the State of Israel. The stakes are huge. Israel can respond in one of two ways. It can continue to treat these as law-and-order incidents, ordering police investigations and arresting the perpetrators. But this is the easy route and does nothing to confront the root of the cause. The messianic zeal that drives these people towards hate and intolerance will never go away. The attacks will continue and Israel will be confronted with an insurrection against democracy, justice and the rule of law. The second is to go after the root of the problem. Israel, with Netanyahu at the helm, must collectively rise up and once and for all say enough to racist and extremist Zionism and the lawlessness it breeds. Unless the ideology is confronted head-on, it will continue to strike at Israel's foundations and undermine the true Zionism, rooted in hope and idealism, that unites the vast majority of Israelis and Diaspora Jews. This is much more challenging and heart wrenching. It will require the country to stand up to its own extremists and rogue saboteurs, and definitively take a stand against the concept of a Greater Israel, a dream that can only be built upon racism and occupation. But it is the only way forward. Yitzhak Rabin left behind a legacy of peace, of acceptance and hope for what Israel's future might be. Peace Now is an Israeli organization brave enough to stand up and say when the country has gone astray and to defend the human rights of all. One would've hoped that attacking such targets, not to mention all the Palestinian property in the West Bank, would've been enough to bring the attention needed to finally stop such acts and the ideology behind them. Fortunately, Tuesday's attack might be the straw that breaks the camel's back. The genie is out of the bottle. All that remains to be seen is if Israel has the courage and strength to confront its inner demon.